By using the model 810013 to create a vacuum within the chamber, a strong suction can be generated at the tube inlet, strong enough to draw in the excess epoxy. The glue can be collected in the chamber for recycling and reuse, and because of the design, the glue does not pass through the E-Vac and cause any issues with build up or blockage that would hinder the performance, leading to the need to clean the unit. 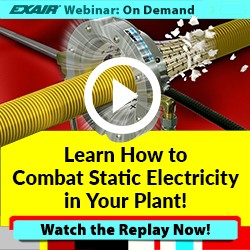 EXAIR manufactures E-Vac’s for both porous and non-porous applications, as well as a line of Adjustable E-Vac Generators. Smallest units use only 1.5 SCFM of 80 PSIG compressed air and the largest Adjustable E-Vac unit can pull 81 SCFM of air at open draw and 15″ Hg vacuum level setting. With a wide range of sizes and types, there is a model available to meet your vacuum generation needs. As a side note – the EXAIR Reversible Drum Vac, High Lift Reversible Drum Vac, Chip Trapper, and High Lift Chip Trapper all use this same basic principle of applying a vacuum to a chamber, but on a much larger scale, to turn a 5, 30, 55 or 110 gallon drum into an industrial liquid vacuum system. 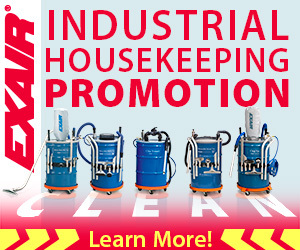 The vacuum generating unit is of a different design, made specifically for the Industrial Housekeeping Products. To discuss your process and how an EXAIR Intelligent Compressed Air Product can solve your toughest application issues, feel free to contact EXAIR and myself or one of our other Application Engineers can help you determine the best solution.